Yahoo it's Saturday! This has been a killer week at work. But, I am happy to say that I did get to spend some time in my craft room. I am the hostess over @ Our Creative Corner. I wanted to make this challenge with a theme or a style, and let you use the products you have on hand, and either try something new, or really dazzle us with your talents. The style for this weeks challenge is 'Shabby Chic'. The new year has arrived, but let's not forget about the things from our past. 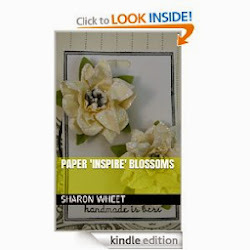 So, create a paper craft item (3-D, scrapbook page, tag, a card, etc.) in a 'Shabby Chic' style. Here are some guidelines for this style: Shabby Chic style is generally characterized by a time-worn look that is achieved by inking and distressing. There are layers of softness that is achieved by the use of ribbon, lace, and crochet trim. There are feminine embellishments, such as buttons, pearls, glitter, and other sweet embellishments. I used crumb cake cardstock as the card base. I just love Stampin' Up! 's version of this color. It has a creamy richness that is amazing. I added a soft pink layer, blush by Amuse Studio cardstock. And then I layered some pattern papers on top of that! The pink floral pattern paper is a new line from Authentique. The text paper paper is from Paper Studio. You can find it at a big-box craft store. I wrapped a piece of very vanilla seam binding and some new pink lace trim from Stampin' Up!. I then did a simple machine stitch all the way around the card. I just love this look. I added a banner piece of aqua houndstooth pattern paper. This pattern paper is a new line called vintage chic. I just love the color and pattern. I did a few zig-zag stitches. I took an aqua mist button and added some glue and then dunked it in a tub of fine glitter. I added a flower shape of text paper under the button. Then I tied it to the front of a multi-loop bow. The tag is cut from a tiny tag die. I purchased this laundry stamp set and have been waiting for the perfect piece to stamp. So, the three stamps I used are: hand wash, do not iron, made with heart. I added three blossoms from a flower trim. Love the flowers! I am a big fan of doilies on cards. So, I added one of Martha Stewart's doilys. I cut a 1 1/2" circle from a digital download. Very pretty. I added some half-pearls, and a silhouette postage stamp. Not too many layers, but I think it's pretty. I am really happy with this little gem. Thank you for looking. I hope you have been inspired to play along with us @ OCC. 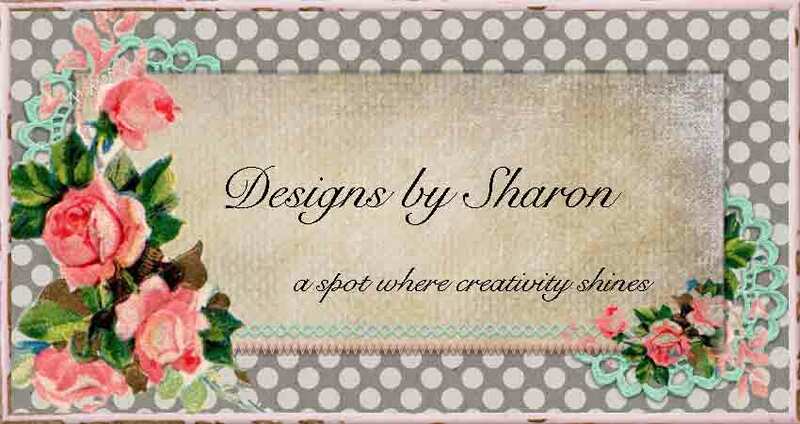 Wow, that's lovely Sharon! The rose paper is just so pretty, and the soft ribbon and lovely long green banner are gorgeous - great stitching too! Beautiful, beautiful card! My goodness, girl, your work is amazing!!! I have just discovered you through the OCC Challenge and have subscribed for email notifications. I was wondering where you found the silhouette postage stamp? I have a stamp set with this image and would LOVE to have this beautiful little accent piece! Please send me an email when you have a moment...angelladcrockett at yahoo dot com. Thanks so much! God bless! Wow, shabby chic at its best, look at all those delectable layers, and elements. You have got everything that appeals to the shabby eye on this card, and as I have a penchant for this genre, it certainly appeals to me very much. This is a great challenge, perfect for me, even though I did not find it a challenge, but pure enjoyment. Firstly, let me thank you for the most wonderful message you left me on my blog. I was so happy you thought I did your challenge justice. I wanted to thank you for the VERY inspiring theme you picked this week. Shabby Chic is not something I find "easy" to accomplish so I really wanted to give it my all when I read your requirements. Now for your card. I'm in complete awe! One of my favorite things to do when looking at a card is seek out the little bitty details that the crafter adds for a special touch and I LOOVE your zig zag stitching, but that little bitty tag just sent me!! That is ADORABLE. I can't believe you added 3 stamps to it, it's perfect! Your combination of colors, design, embellishments, layout, all of it IS Shabby Chic perfection and you my friend, are an inspiration. Oh, p.s...I have GOT to get me some of that SU crumb cake CS....GORGEOUS! 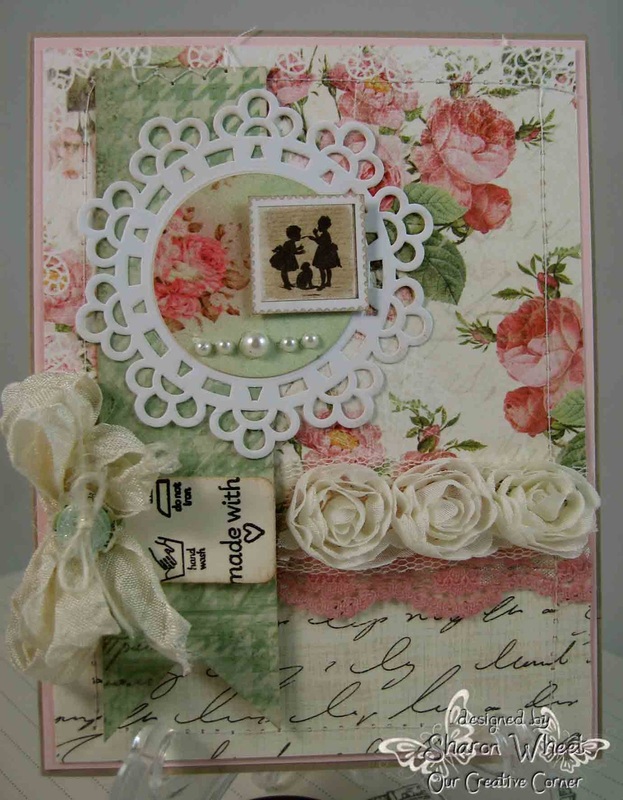 The silhouette accent piece is from the Mini Vintage double page of Heartwarming Vintage Creative Scraps, from Crafty Secrets.